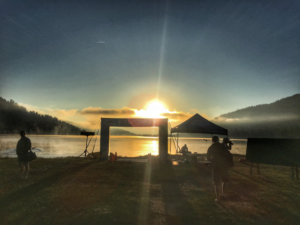 This past Sunday, September 10th, 2017 was the inaugural Truckee Swim Classic hosted by Big Blue Adventure as part of the Sierra Open Water Swim Series. 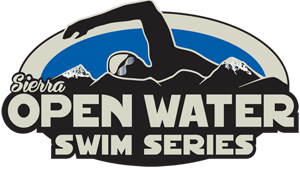 The series boasts four distinct events throughout the summer months in addition to this event: the Sand Harbor Swim, Alpine Fresh Water Swim and the Lake Tahoe Swim. Individual swimmers can opt to race in a 2.4 mile, 1.2 mile or 500 meter race. The race also includes a 4×100 meter relay option for teams as well as Kids’ Races. This was going to be my first open water swim race so naturally I decided to swim the 2.4. Go big or go home – right? That was kinda, sorta the case with me. I had been swimming a lot leading up to the race – not necessarily to train for the event, but because I was coping with a calf injury that tabled all of my running for about a month. In an effort to stave off endorphin withdrawals, I turned all of my attention to swimming and cycling. Endorphins make me happy. Exercise produces endorphins therefore exercise makes me happy. Really really happy. You know what I’m talking about! Besides, there’s no better way to see the beauty that surrounds us – you don’t get that in a gym! Anyway, I had a few long swims under my swim cap leading into the race including a three-mile East to West Donner Lake swim and a six-mile Donner Lake circumnavigation. The result: ego inflated. So yeah – 2.4 miles? No problem – I got this [I think]! The race takes place at West End Beach, which offers an incredible vantage point for some spectacular sunrises. The morning of the race didn’t disappoint. 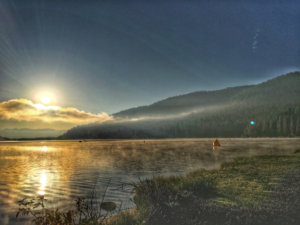 As the sun came up during check-in, the sky lit up in a spectrum of color, steam rose off of the lake in white ribbons and the moon was perfectly positioned above the peaks that hover over the beach. 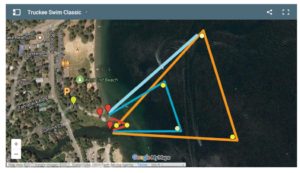 As for the course itself, the 1.2 and 2.4 mile options consisted of laps around three buoys in a triangular shape (see the orange triangle below). The blue triangle depicts the 500-meter course. 1.2 mile swimmers completed two laps while the 2.4 mile swimmers completed four laps after a swim start in the canal that you can see leading into the lake. If you don’t know Donner, this canal is the inlet into the lake and is full of water coming from runoff at higher elevations. In other words, it’s snowmelt and it’s cold. Thankfully, the start is the coldest part of the course and it only got warmer from there. Swimming out of the canal, into the more shallow depths gives swimmers the ability to see the floor of Donner Lake, which is actually quite interesting if you can relax enough to pay attention to it. There’s a lot to see – fallen trees, little white shells and the shelf of the lake, which drops dramatically. You can actually see it in the picture above. Notice where the brighter green turns to darker green – right about that spot, swimmers transition from easily being able to see the bottom of the lake to swimming in an abyss of dark green water. With 2.4 miles of swimming to go, it gave me plenty of time to take in all of the scenery both above the water and below. Mentally, I initially found the first two laps to be a bit daunting and not as interesting as a point to point would have been. With that said, I found that I enjoyed being able to tackle different parts of the course with more efficiency with each lap. For example, with the first lap I found that I kept getting pushed out to the right of the first buoy. Now this could have been a fault in my navigating as we were sighting into the sun, but physically, I’m almost convinced that there was a slight current created by the water flowing into the lake from the channel. With the subsequent laps, I was able to compensate and maintain a more direct line out to the first buoy. As the sun climbed higher in the sky, I could hear the announcement of swimmers coming in to the finish line from the various distances. I got to hear a lot of them – I had started the race in the back of the pack and stayed there the entire time. Rounding the last buoy and making my way into the finish I was surprised with a fresh-water kelp forest that was beautiful, but at the same time, a bit creepy to swim through. As I crawled on to the shore and made my way through the finish arch, I was met with a wildly opposing set of realizations. First, the time clock read 1:12:44. I finished almost 18 minutes faster than I had anticipated. I was elated! Second, and completely in contradiction to my first reaction, I realized that I may be the last person out of the water. I actually asked Bryan Rickards (Big Blue’s Director of Ops) at the finish arch if I was “DFL” – Dead ____ Last. No, but very close. I was completely humbled. DFL isn’t a dig; it’s not an insult. DFL is a badge of honor to be worn proudly. It means that you had the guts to take on a challenge, and the tenacity and grit to finish regardless of how you might place. It means you didn’t give up and drop, or ask for a tow in to shore. Humbled by the talent and speed of the field and inspired to train harder and with more focus, I will be back next year to see if and how I can improve my performance.